The buoys were banging. It was the first big swell of the season. Ocean Beach, just south of San Francisco cradles swells. With no natural barriers the break welcomes any ocean action, from ripples to mountains. “That day was my first time surfing giant Ocean Beach. 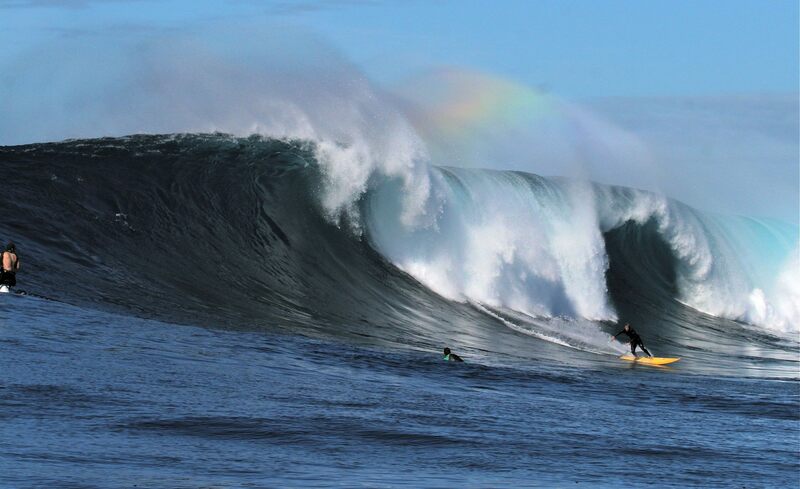 It’s a heavy paddle out, like six to eight football fields out,” Scotty Bredesen said. Now when the buoys are banging, Bredesen can often be found making a cannonball run up the 5 with his Joe Bark guns piled in his vintage Chevy Suburban, sans surf stickers for discreteness. “Surfing big waves isn’t only about the actual act of catching big waves. It’s about making the decisions to drop everything and be there at the right time,” he said. The Palos Verdes native comes from a South Bay surfing family. His dad Chris was a Los Angeles County Lifeguard and in the ‘60s a member of the Greg Noll Surf Team. Today he is a member the Haggerty’s Surf Club and the Hap Jacobs Surf Team. Scotty’s older brother, Chris Jr., was seen all through the pages of the now defunct Longboard Magazine during the zines heyday, 15 years ago, performing his progressive longboarding style. Chris Jr. is also a lifeguard and member of the Jacob’s Surf team. Every summer growing up the Bredesens vacationed on Maui with the Meistrell family, owners of Body Glove and Dive N’ Surf. “I learned to surf at Ka’anapali Point when I was five, after doing the whole boogie board shorebreak thing,” Bredesen said. In high school, Bredesen was on the Peninsula High Surf Team, which dominated the South Bay until 2005 when the hill’s top surfers migrated to the newly opened Palos Verdes High. Bredesen was an anchor for the longboard team for four years and in his senior year won the All Star title. Bredesen, now 29, has been a recurrent lifeguard for 10 years. Four years ago Bredesen was visiting a friend up in Cen-Cal. The surf report forecasted an epic swell, perfect for lighting up the region’s secret reefs. Bredesen borrowed Joe Bark’s back-up gun and paddled out in hammering, triple overhead surf. “I got caught inside and was thrown into full survival mode,” he said. “I never had been so sketched out in my life. That’s when I was hooked, especially after talking about the waves afterwards, over a few beers. The quest for big waves became the focus Bredesen’s life: lifeguarding in the summer and “chasing the dream” of the heavies in the winter. Another person Bredesen talked to was fellow Palos Verdes surfer Joe Bark. Bredesen grew up with a family quiver of Bark surfboards and paddleboards. With Bark and other sponsors, including Body Glove, Zico coconut water, and Freestyle watches (he was in the Freestyle Watch ad in the “big” June 2014 issue of Surfer Magazine), he feels that he now has to put himself out there. Over the last four years, Bredesen has been chasing bomboras up and down the California coast, as well as in Mexico. Bredesen took his worst thrashing two winters ago at Todos Santos, 13 miles off Ensenada. The big, right hand point break was maxing out at 30-plus foot. When the rescue ski picked him up he had a bloody nose and a snapped gun. While recovering on the boat, he questioned what he was doing here. He waxed up his full on, 10-foot-6 Bark rhino chaser, a board he had yet to even paddle and jumped off the boat. Then he made the same mistake that had gotten him in trouble earlier in the day. He went for a small wave, got caught inside and took the next set on the head. But this time, he was able to get back out to the lineup. 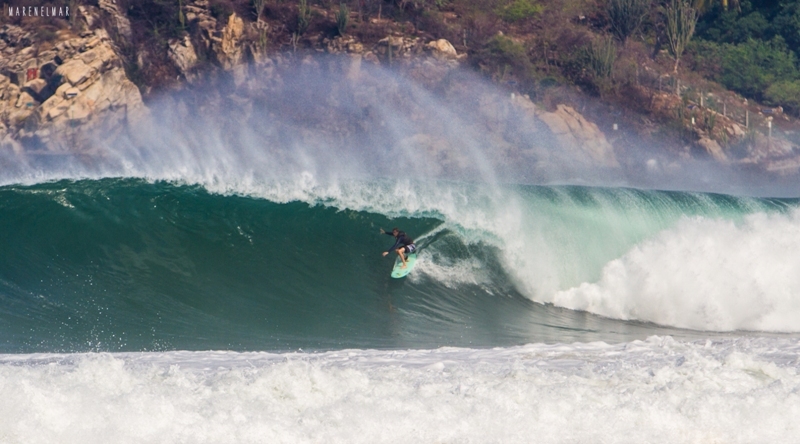 Puerto Escondido is another barreling Mexican break that Bredesen has established himself, at a price. Last May, on his fifth trip to Puerto, Bredesen found himself in a lineup of international surf stars. Bredesen mistimed his paddle out and was thrashed by a double overhead, pitching lip. “It felt like a cement truck was pouring down on me while I was pinned to the ocean floor,” he said. On his second attempt to paddle out, he barely pushed through to the outside. A freak left peaked 20 yards south and coming straight at him. “My eye lit up. I dropped into a bomb,” he said. He was swallowed up by the 20 foot, closing tube, slide slipping at one point and grabbing a rail while going for broke. “When I was spit out, I realized I had just caught the barrel of my life,” he said. Besides becoming a full time LA County Lifeguard and an all around waterman with a life centered around the ocean, Bredesen’s other current goal is to get a bomb at Mavericks, California’s most fabled big wave spot. Qualifying for the World Surf League Big Wave Tour is another fantasy that plays in his head, but it’s not what motivates him.